The enclosure provides a degree of protection to personnel against incidental contact with live electrical equipment. It also provides protection for the enclosed equipment against specific environmental conditions. Safety switches may consist of a switch only or may consist of a switch and fuses. Safety switches can be used in any number of applications. The National Electrical Code® (NEC®), for example, requires that a disconnecting means shall be located in sight from the motor location and the driven machinery location (Article 430.102(B)). The NEC® defines “in sight” as visible and not more than 50 feet (15.24 m) distant (Article 100 – definitions). Regardless of where the safety switch is used, the function is to provide a means to connect and disconnect the load from its source of electrical power. A safety switch with no associated fuses is referred to as a non-fusible safety switch. A non-fusible safety switch has no circuit protection capability. It simply provides a convenient means to open and close a circuit. Opening the circuit disconnects the load from its source of electrical power, and closing the circuit connects the load. Circuit protection must be provided by external overcurrent devices such as a circuit breaker or fuses. In the following illustration, power is supplied to a motor through a non-fusible safety switch and a separate fuse. 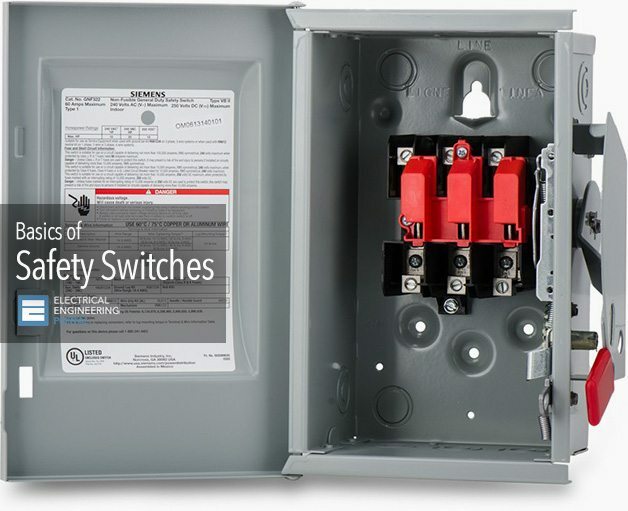 A safety switch can be combined with fuses in a single enclosure. This is referred to as a fusible safety switch. The switch provides a convenient means to manually open and close the circuit, and the fuse provides overcurrent protection.